Each month we will hand-select fun and unique food holidays to celebrate in our diner with a special deal just for you. 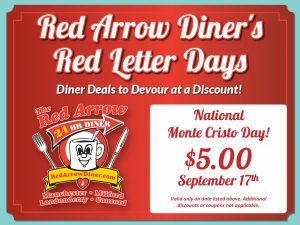 On September 17th, we introduced the first Red Arrow Diner Red Letter Day by commemorating National Monte Cristo Day with special pricing for this famous sandwich. Diners were pleasantly surprised that for just $5, they could enjoy this meal deal: ham, turkey and Swiss cheese piled in between two fluffy slices of french toast and a side. What’s not to love?! Be sure to ‘like’ and follow our Facebook pages to keep an eye out for more Red Letter Day deals! Have a red letter diner day!